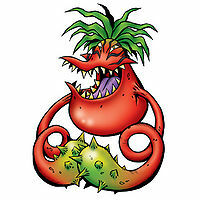 A strengthened version of Vegimon whose entire body has ripened and turned red. 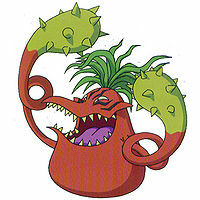 It has high intelligence and offensive ability, unlike Vegimon, who is still unripe. 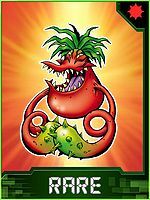 This red, ripened form is Vegimon's true form, and it is possible that the harsher environments found on the Folder Continent caused Vegimon to take on this original form. Its personality has turned even more devious and cunning. Its Special Move is a spewing out its putrid, poison-laced breath (Hazard Breath). Anyone who carelessly tries to take it on, mistaking it for an ordinary Vegimon, will no doubt meet a terrible fate. n., From "vagitable", a misspelling of vegetable. Anime/Manga Digimon Adventure: "Oh Wind! Oh Light! Saber Leomon"
ハザードブレス Hazādo Buresu Stink Jet, Rotten Rainballs/Hazard Breath Breathes a cloud of putrid, poison-laced gas. レッドソーン Reddo Sōn Spike Punch, Red Zone Hits the opponent with a straight jab. Kyūkei  Rest / Corm きゅうけい N/A Rest Takes a nap. 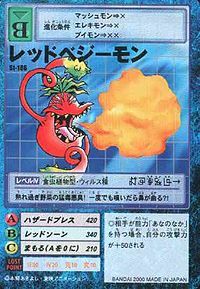 レッドホットマシンガン Reddo Hotto Mashin Gan Chili Pepper Pummel Rapid-fires numerous chili peppers out of its mouth. Pinochimon summoned a bunch of Red Vegimon in front of his mansion to try and defeat the Chosen Children and their Digimon, but failed. Red Vegimon under the control of an Evil Ring. Red Vegimon was one of the controlled Digimon under the control of the Digimon Kaiser. He and the Vegimon enslaved a Gazimon village that Gabumon was at. During Gabumon's attempt to escape, Red Vegimon assaulted him and threw him in the river. He later assaulted V-mon enough for the Dark Tower to crack and enable Gabumon to evolve to Garurumon. While Garurumon was handling the Vegimon, V-mon evolved to Fladramon and defeated Red Vegimon. When they destroyed the Dark Tower, Red Vegimon was freed from the Digimon Kaiser's control. Red Vegimon is an enemy Digimon. Red Vegimon evolves from Mushmon with 1-3 DP. Red Vegimon evolves into Jyureimon with 0+ DP. Red Vegimon is available as a Digimon Medal. Evolves from Floramon or Mushmon. Can evolve to Jyureimon or be Jogressed with a compatible Digimon to get Delumon or Gerbemon. Evolves from Palmon or Mushmon. Can evolve to Jyureimon or be Jogressed with a compatible Digimon to get Delumon or Gerbemon. 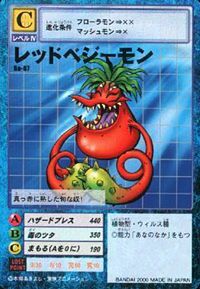 Red Vegimon is an unobtainable Leader Digimon. The poisonous stench of an overripe vegetable! Just sniffing it once will make your nose fall off?! A hot guy who has ripened to become deep red! ↑ 10.0 10.1 Digimon Adventure 02: "King of Darkness, The Digimon Kaiser"
This page was last modified on 10 January 2019, at 20:18.